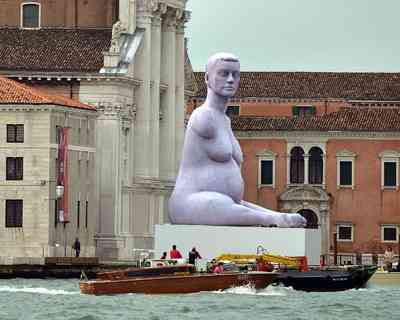 Marc Quinn's giant sculpture Alison Lapper Pregnant, last seen at the opening ceremony of the London 2012 Paralympic Games (CLICK), has made it to Venice for the 55th Biennale. She sits on the San Giorgio Maggiore island to greet the world's press. Alison is familiar to Londoners, because Quinn's original (smaller) statue of her sat on the Fourth Plinth in Trafalgar Square. She is a mouth artist and now a mum, one inspirational lady made famous by a great sculptor. Both raise the tone of the Venice Biennale!